Grade: ? I hope I never have to use it. As an Eagle Scout, I always try to be prepared. So when the folk at BloodStop sent a pack of their gauzes for testing, I immediately put a couple into the bag. The others, I put into the large first aid kit in my car. I hope I never have to use them. I am certainly not going to slice up an arm or leg to run a test. 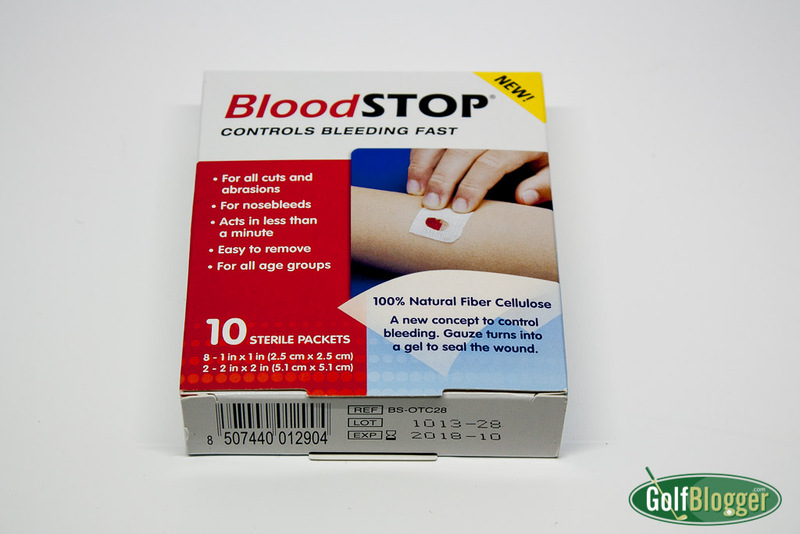 The product is a fiber cellulose gauze that is supposed to stop bleeding very quickly. I imagine that it would be overkill for a minor cut, but could very well come in handy for a more major incident. A few years ago, my sons and I were at a local historic site, when Thing Two fell and rammed a stick deep into his upper arm. We removed the stick but the bleeding just wouldn’t stop. I went through every gauze and microfiber towel in the car before deciding to take him to urgent care. This would have been very useful to have at that point. Postscript: a few months later, the mostly healed wound on his arm got very red and I took him back to the doctor. The Doc took some x-rays and determined that there were still several chunks of wood in the arm. Thing Two was quite brave as the Doc reopened the wound, and dug around for the bits of wood. Eventually four not-insignificant bits were extracted. What Percentage of Golfers Shoot Under 100? The Trees and Flowers of Augusta National. Enter your email to receive notifications of new posts by email. The Five Inch Course will help you play smarter golf to lower your scores TODAY. Bobby Jones said "Golf Is played on a five inch course -- the space between your ears." GolfBlogger.Com is a daily golf blog featuring golf news, golf course reviews, golf equipment and golf book reviews, golf lifestyle, golf fitness, golf history, Michigan golf news and reviews, photography, cigars, food and beverages, the PGA Tour and the LPGA with essays and musings. This is the golf blog of golf’s 99%: The working stiff who plays at munis with ten-year-old clubs and whose family and work take precedence, but whose love of the game never diminishes. The Golfblogger is a member of the Golf Writers Association of America. Proudly Made In Michigan Since 2004.